Previously, on MinerBumping... Agent Wescro, despite a long and sordid corp history, was accepted into a highsec mining corp. He joined one of their mining ops in a Raven, and killed the corp's Orca. The corp's CEO decided to take disciplinary action against the new recruit. 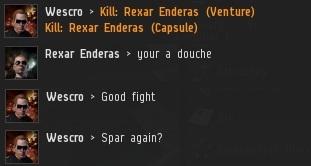 Rexar Enderas runs a tight ship. 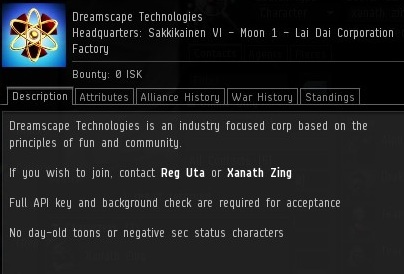 Mining ops are for gathering ore in highsec, not for killing other corp members. In other words, no funny business. 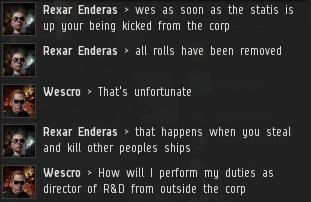 Wescro preferred to kill miners, rather than mine. Given the corp's zero-tolerance policy on the matter, Rexar decided it just wasn't a good fit. Wescro continued to debate the issue with Rexar. As they spoke, Wescro's destroyer crept up on the CEO's mining vessel. Sun Tzu would be proud: Wescro used surprise to his advantage and won the duel. 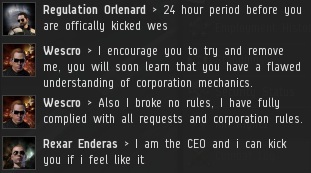 Having violated corp policy by killing an Orca, Wescro was already on thin ice. Winning the duel didn't help matters. Wescro forgot a classic rule of business etiquette: Always let the boss win. Rexar vowed to retaliate against Wescro and drive him from the game. In the meantime, everyone would need to dock up to avoid further losses. Incredibly, Rexar's threat proved empty. 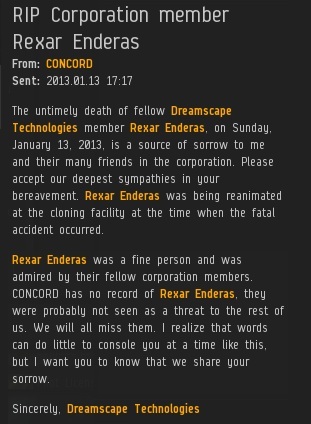 The Orca disaster eroded popular support for Rexar, making his position as leader of the 5-member corp tenuous indeed. Rexar was forced to resign. If you're unfamiliar with it, the above is the standard form EVEmail you receive when a member of your corporation biomasses himself. Honour demanded that the disgraced former leader of the corp destroy his own character, permanently. 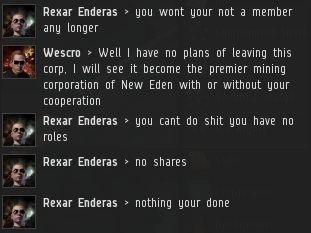 Rexar is no longer in EVE. The corp, Dreamscape Technologies, took a severe hit. It had lost CEO Rexar Enderas and R&D Director Wescro in one day. The replacement CEO created a new background check policy--they would do background checks. Wescro moved on to bigger and better things. Immediately after I posted Part 1, the CEO of Wescro's new corp was inundated with warnings from readers about Wescro's difficulty in being a team player. Wescro hates office politics, so he retaliated by killing some miners in the corp. But Wescro always lands on his feet. He immediately joined yet another mining corp, and killed a pair of Hulks. Wescro's mining credentials may be unimpressive, but he always aces the interview. 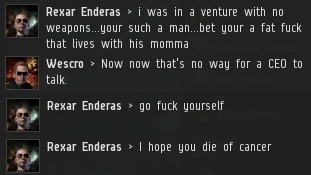 In the past i have my share of idiots in EVE, but this ones are the best of the best. Ah and congrats for CEO's biomass. You killed an immortal! Good job!!! 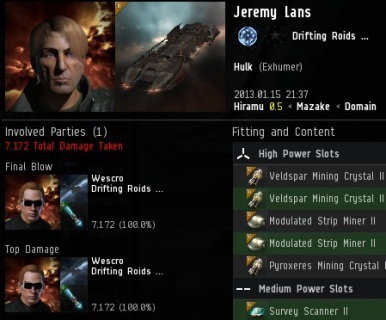 You can retire from EVE now. I hope you stay and keep up the good work, but I wouldn't blame you for quitting now that you've won EVE. \o/ Victory for the New Order! "Wescro's mining credentials may be unimpressive, but he always aces the interview." This line made me absolutely bust out laughing. It's one example of the kind of writing that keeps me coming back here daily. Hugs for James. 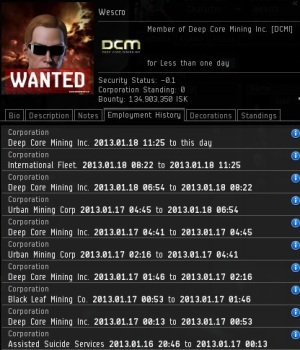 You can get in to a lot of highsec mining or mission running corps with hilariously dirty histories with no difficulty at all because they don't bother to check, even if they do ask for your API. Infidels, by antimatter you shall be purged. Congrats! 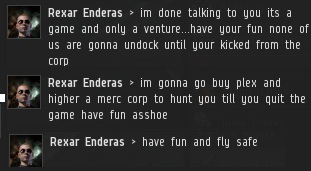 Forcing somebody to biomass themselves is still on my eve bucket list. 290xanaots - No one forced the ceo to biomass he did it because he didn't want to play eve any more. Certainly a drastic action and one he will later come to regret, however I can't help feeling this will be a bad thing for the New Order if more people take this action in the heat of the moment. Being too good at this may be a bad thing in the long run. I had absolutely no intention of seeing the CEO biomass, I was in fact hoping to stick around and see how he adapted to adversity and delivered on his threats. 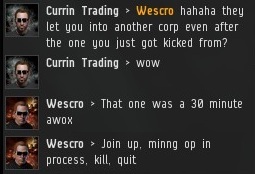 On at least one occasion, my awox victim has gone on to thank me for the lesson in proper recruitment, and gone on to join the New Order, and I helped him through it. The idea isn't to make someone miserable in every way possible, the idea is to punish bad game play with good playing. At least that's how I see it. CEO is probably a corp management alt. 4 hours old before joining that corp.
We have no control over wether or not they permanently delete their characters in a hissy-fit and re-sub to Hello Kitty Island Adventure or whatever.